Kidney Over Chair Table For Armchair Comfort. Based on the concept of the curved office desk, this over chair table is designed to provide maximum armchair comfort. 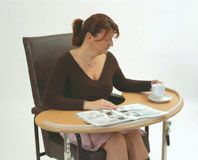 The 'kidney' shaped table top provides the user with a comfortable resting position whilst having a large usable work surface. The ergonomically designed height adjustment levers are easy to use, ideal for arthritic hands. 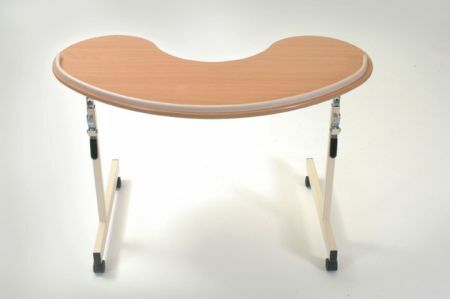 This table is the ultimate in both comfort and visual appeal with the beech effect top having a cream retaining edge to match the hard wearing nylon powder coated frame. Supplied flat packed. Height adjustable 650mm to 800mm (25½" to 31½").